Someone told me once that you can describe a software tester (my own tiny branch of IT specialty) as someone who “imagines the world could be different.” Not the world is different, but that it could be. The tester imagines, and asks questions to confirm if, say, reality deviates from the project plan. If you will, for just this blog post, please, imagine along with me. Notice the only thing that changes in the instant is the face; the digital signage is fine, the suit, the shirt, the tie, everything is fine. There is just some sort of signal problem with the face. In that instant, It looks remarkably like someone else, not the president, is giving the speech, and the presidents image is projected overtop. Or perhaps the opposite. Or perhaps this is just some digital ‘fluke’; a problem with the codec, the algorihmn that compresses the pixels to form a real-time transmission. And, If that were the only problem with the debate, that might be it. 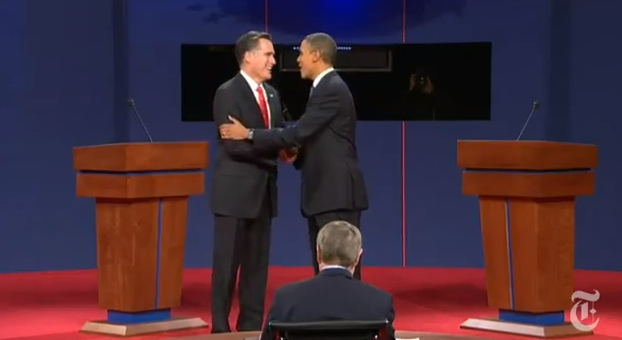 At one hour, eighteen minutes, and thirty-eight seconds into the debate, there is a picture of Mitt Romney. 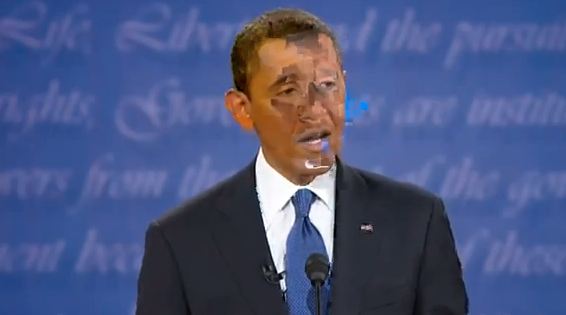 His face becomes distorted as well, and the screen behind him appears blank – as if the words were being projects, and the software somehow failed. It’s not just the debators. What about the audience? 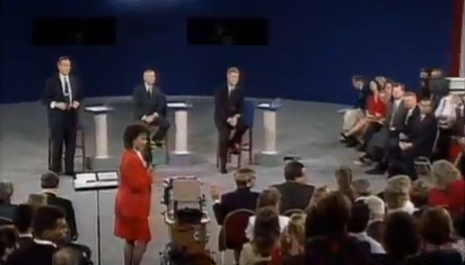 If you watch the evolution of the debate process, from the first televised debate with Richard Nixon and John F. Kennedy to today, you see a slow, consistent, specific move toward a background which looks … a whole lot like a green screen, used to project images and create fake backgrounds and foregrounds. And what about that teleprompter? We see it at the beginning of the debate, front and center, then .. never again. 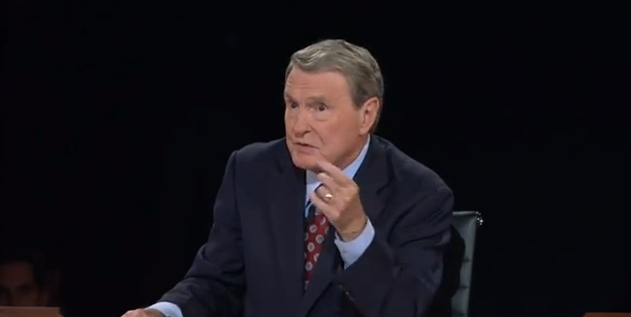 It is almost as if someone was telling the moderator what questions to ask, and they didn’t want the audience to realize he was anything other than running the debate independently. The error at 46:41 could easily be a codec problem; the algorithm would detect movement and compress everything else. At that time, all that is moving is the president’s head. What looks like a “blue screen” behind Mr. Romney is really a problem with camera angle; the screens with text are depressed; looking out from one, you won’t see the other, but instead the four red line, which is clear in this picture. 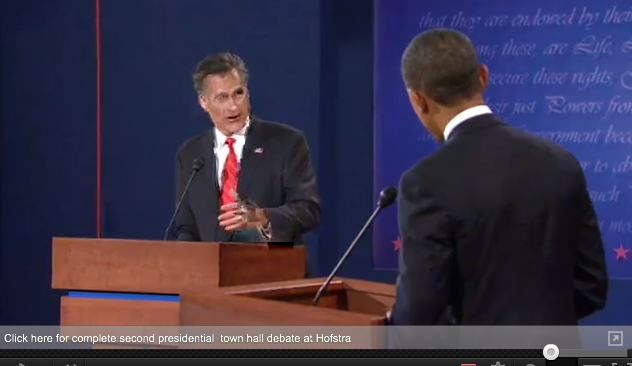 Running a presidential debate, the moderator did want a teleprompter. Again, the camera angles were just framed so that it did not show up most of the time. Thanks for playing along with me, but it’s all a coincidence. Here’s my final analysis: The cameras were designed to give a very specific image to the viewers. The audience’s involvement was restricted, probably to limit the risk of something saying the wrong thing at the wrong time. The text on the background was projected, but this was on purpose, it was a digital display. And yes, the speaker did have a teleprompter which was purposefully de-emphasized by the camera. Digital manipulation – through photoshop or iMovie – is simply a reality of American life, a routine practice for the magazines you find at the grocery checkout counter every week. So, while the debate might not include aliens pretending to be human, there certainly were interested parties trying to influence our perception of reality … and the rapid pace of technological change has a real impact on our society. More on that next time. For now, I hope you found this little digression at least a little bit entertaining.